It may seem like head coach Dan Bylsma has done it all in his four-plus seasons behind the Penguins bench. That’s because he has. Now you can add one more accolade to his massively expanding list. Bylsma became the fastest coach in NHL history to reach 200 wins (316 games) following the Pens’ 3-1 win at Ottawa. Bylsma’s career record is 200-91-25. Not bad for a coach who is only 42 years old. The Penguins brought Bylsma to Pittsburgh to salvage their 2008-09 season. The team was in 10th place in the Eastern Conference and in serious danger of falling out of the playoff picture. On Feb. 15, 2009 the Penguins named Bylsma interim head coach, hoping he could spark the team back to life. Neither side has ever looked back. With his enthusiasm and aggressive, attacking strategy, Bylsma engineered an 18-3-4 run that catapulted the team to the fourth seed. The Penguins eliminated Philadelphia, Washington, Carolina and defending Cup-champion Detroit to win their third Stanley Cup in franchise history. All four series were clinched on the road, including two Game 7 wins (Washington, Detroit). After dropping the first two games to Detroit, the Penguins won four of the next five to claim hockey’s holy grail. But perhaps his most impressive coaching effort took place in the 2010-11 season. The Penguins suffered 350-man games lost due to injury, including 119 to the team’s three best players: Sidney Crosby (41 games); Evgein Malkin (39); and Jordan Staal (39). Despite the losses, the Penguins posted a 49-25-8 record for 106 points, tying Philadelphia for the division lead. For his efforts, Bylsma was rewarded with the Jack Adams Award as coach of the year. 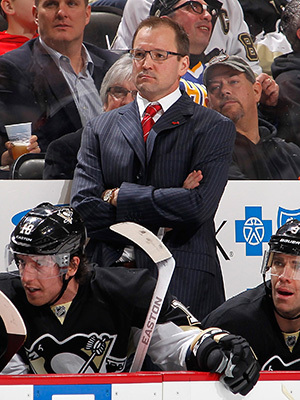 Feb. 15, 2009 – Penguins hire Dan Bylsma as interim head coach. Feb. 16, 2009 – Bylsma coaches first game with the Penguins, a 3-2 shootout loss, at Nassau Coliseum against the New York Islanders. Feb. 19, 2009 – Bylsma records first victory as NHL head coach, 5-4, over the Montreal Canadiens at Mellon Arena. April 15, 2009 – Penguins open playoffs with a 4-1 win over cross-state rival Philadelphia, Bylsma’s first postseason win as head coach. April 25, 2009 – Penguins eliminate Flyers and advance to second round with a 5-3 come-from-behind win at Philadelphia in Game 6 – Bylsma’s first playoff series victory. April 28, 2009 – Penguins GM Ray Shero removes the “interim” title from Bylsma, making him the official head coach for the foreseeable future. June 12, 2009 – The Penguins defeated the Red Wings, 2-1, in Game 7 at Detroit’s Joe Louis Arena to claim the organization’s third Stanley Cup title. Bylsma becomes only the third head coach to lead Pittsburgh to a Cup championship. Bylsma also becomes the 14th rookie head coach, and just the fourth in the past 50 years, to capture the Stanley Cup. Of those 14, only Montreal’s Al MacNeil (1970-71) took over mid-season. Dec. 11, 2010 – The Penguins defeat the Sabres in Buffalo, 5-2, for their 12th straight victory and stretch their unbeaten streak to 15 games (14-0-1). The 12 consecutive wins ties for the second-best streak in team history, and ties for eighth longest in NHL history. The Penguins also win their seventh-straight road game, trying the franchise record previously done twice. Of the three times Pittsburgh has won seven consecutive road games, twice have come with Bylsma as head coach. Feb. 10, 2011 – The Penguins knock off the Los Angeles Kings, 2-1 in overtime, for Bylsma’s 100th career victory. He becomes only the third Penguins coach to hit the 100-win mark. Bylsma is the fastest Penguins coach to 100 (163 games), while he ranks as the fifth fastest in NHL history. June 22, 2011 – Dan Bylsma is awarded the Jack Adams Award as the NHL’s most outstanding coach. He becomes the first coach in Penguins history to win the award. Jan. 13, 2012 – The Penguins defeat the Florida Panthers, 4-1, for Bylsma’s 136th career win, moving him into second-place all-time in franchise history (passing Michel Therrien). Feb. 26, 2012 – Bylsma becomes the fourth-fastest coach in NHL history to reach 150 wins (251 games) following a 4-2 win over the Columbus Blue Jackets. April 22, 2013 – Bylsma wins his 200th career NHL game after the Penguins conquer Ottawa, 3-1. Bylsma becomes the fastest coach in NHL history to reach 200 victories in just his 316th contest behind the bench (surpassing Bruce Boudreau, 326 games).